Chemical tanks are produced for stocking of chemical liquids. Sometimes, chemical liquids could be dangerous and it should be stored with safety. So that we have three alternative solutions for chemical tanks. Chemical tanks usually use for storage of different acid types. The most production is made for hydrochloric acid, sodium hydroxide, sodium hypochloride, ferric chloride acid types. Also tanks could be used for storage of chemical waste. The first production group is the vinlyster tanks for chemicals. Vinylester is resin type that is suitable for acid and other chemical liquids. The concentration rate and stock tempature is so important for vinylester tanks. You can control resistance table for your acid type. Tanks dimensions could be changed according to your project. Inlet and outlet valve’ dimensions are also changable. The quantity of valves can be increased. Production could be made as horizontal or vertical in all volumes. Tanks are resist to weather conditions. Tanks don’t react to your chemicals. Vinylester tanks’ usefull life is so long compare with than other tanks. Any equipments can be fixed to vinylester tanks. Ladder, free-flange inlets and outlets or other equipments that you want. You can contact us for chemical tanks in all volumes. Responsives will send you all documents according to your chemical liquid. Polythene is a thermoplastic that has high chemical resistance. Production process is same with water tanks. Chemical tanks are thicker than water tanks. We designate polythene chemical tanks’ thickness according to chemical liquid that you will store in it. This tank group is less costly than others. Chemical resistance is high to chemical liquids in all concentration rates. Tanks are not affected by weather conditions. There will be not any reaction with chemicals. The main disadvantage of polythene chemical tanks is no chance to change tanks’ dimensions. Also location and dimension of inlet can not be changed. Polythene tanks can not be repaired. Produciton is limited to 5000 Liter for horizontal tanks. These production group is usefull for storage of dangerous acid types like sulphuric acid. 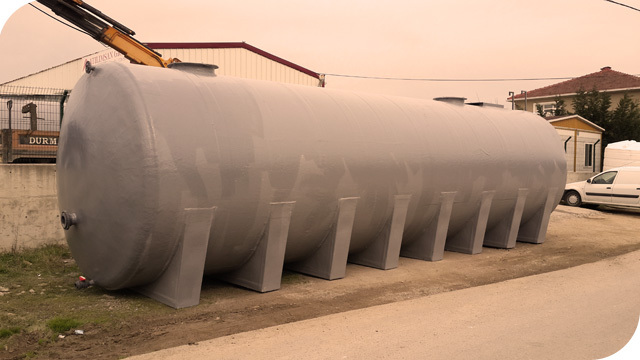 PVC tank is produced with demanded dimensions and coated with vinylester resin. Thickness is designated according to tank volume. These tank group is more costly than the others. Its resistance is so high to all chemicals. We can design its inlet and outlets how you want. Also dimensions are changable. Which chemical liquid that you will stock in tanks, you should tell about it. Concentration rate and its stock tempature is important for tank useful life. Please fix your tank on concrete ground. Don’t exceed the concentration rate and tempature that you tell. Please contact with us for any request.